Rounding out AMD’s slew of product announcements and updates at their Computex 2018 press conference, the company very briefly showed off their first 7nm Zen 2 silicon in the form of an EPYC processor. AMD’s previous roadmaps called for the company to get silicon back around this time to begin sampling by the end of the year, and at Computex the company has confirmed that they are right on schedule. 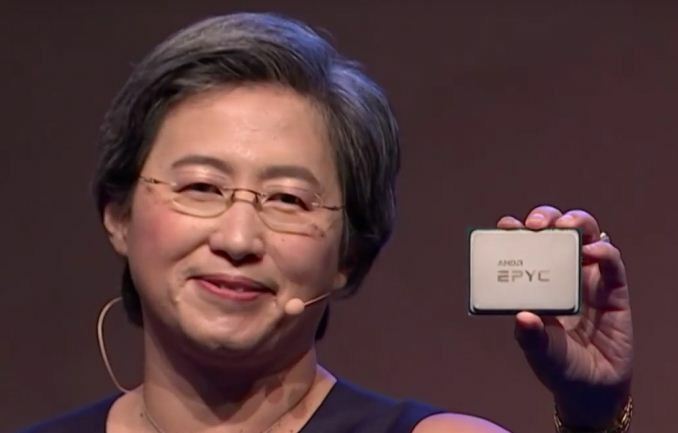 While CEO Lisa Su unfortunately only showed off a capped version of the CPU – so we didn’t get to see the CPU dies underneath – she did confirm that AMD has silicon back in the labs now and is working on bringing it up for retail. 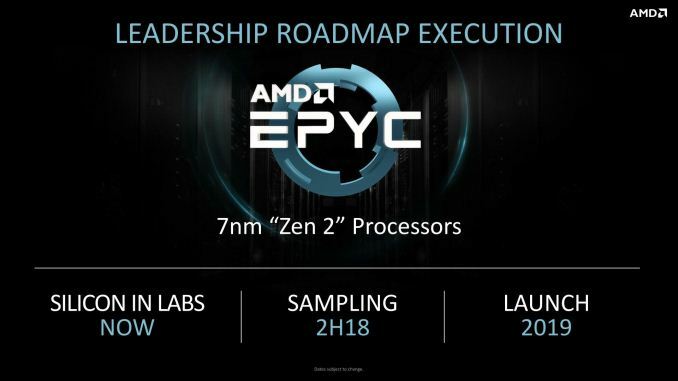 Sampling of Zen 2-based EPYC processors remains on track for the second half of this year. A launch will follow in 2019. The next-generation EPYC will also use the same SP3 socket as the first-generation chips, though AMD did not clarify on what the status of drop-in compatibility will be. It goes without saying that the second-generation EPYC will be even more important for AMD than the first-generation. The long lead times and general cautiousness of server vendors and datacenter customers means that the industry by and large treated the first-generation EPYC as AMD’s chance to prove that it had corrected its ways in the datacenter. Now that they have done that, AMD’s second-generation product will be the company’s first real opportunity to sell EPYC processors in high volume, assuming that the Zen 2-based EPYC lives up to AMD’s claims. Obviously they will are marginal. Right now Zen have an high IPC pretty near to the limits with an accaptable power consumption. It will be clocked faster if GloFo will be able to deliver on a brand new Process. About shipment, an early sampling in H2 means a H2/2019 timeframe. The debug takes a lot of time on a server die (one year) and pretty likely it will not be easy for GloFo to ship fast clocked SKUs on a fine process like 10/7nm. AMD was claiming big improvements to Zen 2 vs the moderate gains on Zen+. "Obviously they will are marginal"??? "the company very briefly showed off their first 7nm Zen 2 silicon"